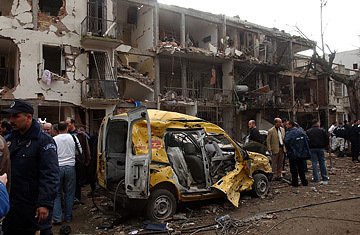 Rescue workers look for survivors in a destroyed building near the United Nations (UNHCR) offices, December 11, 2007, in the Hydra district of Algiers. Death and destruction revisited the Algerian capital of Algiers Tuesday morning when a pair of powerful car bombs exploded, and claimed what early estimates placed at 62 lives. Security experts say there's little doubt the attack was the work of al-Qaeda in Islamic Maghreb (AQIM), a group that formed an alliance with Osama bin Laden's global jihad in 2006. Officials say Tuesday's spectacular strike increases the risk that AQIM is ramping up its violent struggle to bring down the Algerian government. And as the fourth big hit by AQIM in less than a year, the incident highlights the group's increasing organizational skills and establishes it as the greatest potential terror threat to continental Europe as well. The first blast occurred Tuesday at around 9:30 a.m. local time, as an explosives-filled car plowed into a packed bus, immediately killing the driver and a dozen or more university students en route to the law school in the Ben-Aknoun section of Algiers. The point of impact was located outside two highly symbolic institutions of the Algerian state: the nation's supreme court and neighboring constitutional court. Just minutes later, a second suicide car bomb ripped through the nearby Hydra neighborhood, badly damaging the offices of two United Nations organizations: the U.N. High Commissioner on Refugees (UNHCR), and the U.N. Development Program (UNDP). The final death toll may be as high as 100, well above the 30 killed and over 200 injured during the twin car bombings of government buildings in Algiers last April. Algerian officials had claimed that a counter-offensive by security forces since April had decimated AQIM ranks. But smaller AQIM bombings and gun attacks on police or military forces have continued unabated, though often unreported. There was also the September 8 suicide bombing of a coast guard unit in eastern Algeria that killed 32 people. The ability and determination of the AQIM to strike in stunning fashion was made even clearer two days earlier, when a suicide bomber charged the cortege of President Abdelaziz Bouteflika during a visit to the city of Batna, killing 22 people and injuring more than 100. "Any advances made during the counter-offensive by special military forces has been more than offset by the effective recruitment among disenfranchised youths since the insurgents took the al-Qaeda name," says a French intelligence official. The 15-year-old terror group took on that name after affiliating with bin Laden on September 11, 2006. Since that time, AQIM has adopted the structured, stylized recruitment and attack methods of the original al-Qaeda. The use of synchronized attacks by suicide bombers in Tuesday strikes, for example, almost certainly shows the influence of bin Laden's strategists. "The desired message is 'With al-Qaeda, this is a deeper, broader force than a radical group battling the Algerian regime out in the sticks," says the French official. "The attacks are bigger, the damage larger, and some of targets and victims foreign. The message is clear: We're now battling enemies wherever we can find them." Indeed, French security officials say that AQIM's organizational effectiveness makes it the largest risk of non-homegrown terror to continental Europe. The French, who keep a very close eye on suspected terror cells on their own territory, are nervous that the AQIM cells from Algeria may be rolled out against France and other European nations, all relatively easy to reach from just across the Mediterranean. Says one counter-terrorism investigator: "If they can make it in under our radar, we're blind to them  unless they make the mistake of making local contacts. That's our concern." The threat of that kind of imported strike has grown since the AQIM promised to extend its Algerian jihad to Europe. Bin Laden deputy Ayman al-Zawahiri has repeatedly threatened Europe  and France in particular  as enemies of jihadist forces. Meanwhile, French President Nicolas Sarkozy's friendlier relations with the U.S. and relatively pro-Israel positions have only increased extremists' ire. Since his taking office last May, officials say, radical websites have cited Sarkozy's support of Israel  and his own Jewish ancestry  in calling for terror strikes against France. Given the personalized nature of that renewed fury, however, why didn't the AQIM seek a terror attack on Sarkozy or French interests during his state visit to Algeria last month? "Success," explains the French counter-terrorism official. "Trying to kill a visiting leader or bomb a place he's set to visit while security alerts are full is not going to work. Waiting a week until security has slackened to below even normal levels to attack  your chances of success get much better." If that was the AQIM's strategy Tuesday, it promises equally deadly actions for the future.